(See the pictures from Ommegang's BCTC 2010) In the rear-view mirror 10 days later, it still looks just as sweet as one of the best BCTCs ever. Some things were improved upon and, sure, some things can still be improved, but yet this remains one of the country's top 10 beer events of the year in my (and many's) opinion. I particularly like how Larry Horwitz from Iron Hill in West Chester put it: "the best beer festival east of the Mississippi." With that, let's finally get on with things here. Patty and I set out to arrive at Ommegang around 2pm on Friday. The smooth and incident-free drive north was the first of many signs of great things to come. We made the trip in just a shade under four hours and began to set up camp next to a bunch of like-minded folks from in and around Philadelphia. Setting up Camp We hunkered down along the treeline where we camped during our first BCTC five years ago. (Tough to believe that it's been that long.) Camping next to Kevin and Chris with the Amazing Beer Truck (yes, the legend is true...if you haven't experience it, you must), it meant that before long I was checking off one entry on my list of things to do at this year's BCTC: drink a glass of Dell Massey's award-winning 23 Stitch Ale. A 'Belgian Sour/Wild', the beer was named after an unfortunate accident that Dell incurred that resulted in, yes, 23 stitches. This beer was, forgive the analogy, a sour punch to the palate but a great way to begin the weekend. I needed a palate cleanser for sure after this one, but it was fun to see why this beer was an award-winner at this year's National Homebrewers Conference (NHC). If you're a VIP-paying customer of BCTC, then after setting up camp you've got about 5 hours--give or take--to figure out something fun to do. Some go into town to check out the lake, the Baseball Hall of Fame, or numerous other attractions in the quaint village. Some take brewery tours, buy beer and merchandise from the brewery store, or walk the property to meet 'n' greet friends and strangers alike. Yet others, sit around their campsites sampling and trading beers and stories with neighboring campers. Games including frisbees and footballs might break out. Music gets cranked up. And, generally, people are just relaxing and enjoying their time away from their home lives here in this idyllic brewery setting. Beautiful weather doesn't hurt, either. For the first year that we can recall, weather conditions cooperated from start to finish. With relatively low temperatures and humidity, no rain whatsoever, the warm days and cool nights made for practically perfect beer festival conditions. No setting up or breaking down camp in the rain. No nasty, sweaty, dehydrating conditions in which to drink beer. Thanks to the festival organizers for doing whatever it took to strike a great deal with Mother Nature this year. The VIP Dinner After lounging, playing games, and socializing around the campsite with great beer, it was time for the VIP dinner to begin. To kick the dinner off, Simon Thorpe (president of Duvel USA) and the founder of Ohio's Winking Lizard chain of beer bars (name escapes me and I haven't yet tracked down a name) talked about Belgian Beer culture in the U.S. and how it has evolved over the years. Again this year, the VIP dinner was a six course meal with healthy serving sizes alongside unlimited amounts of the Ommegang, Duvel, and Chouffe families of beer. The Horseshoe Lounge Playboys entertained the dinner crowd for a few hours during and after dinner. I'm not sure the emphasis was all about pairings at this dinner, and am still not sure that it matters. What it is, is a great evening of food, beer, music, dancing, fellowship that gets the weekend kicked up into high gear right quickly. For every newcomer that has ever attended BCTC--and even still to this day for many of the more tenured attendees--learning how to kick up into high gear without burning out on Friday night is quite a skill that must be mastered if they are to make through 'til Sunday morning without completely self-destructing. Because in a weekend of great beer and inviting ambiance, the latter is so completely, totally possible. The night continued on, as it always does, with bonfires, eating and drinking from one campsite to the next, largescreen movies provided by Ommegang, and a whole bunch of tomfoolery (not to be confused with TomFolery...sorry inside joke). The (first) Morning After Saturday morning comes quick, which means a morning of staggering around attempting to regain some level of wits and composure before doing it all over again. 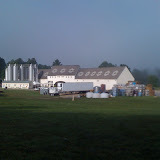 The brewery provides outdoor showers, which lines quickly form for beginning around 8am. Like the day prior, folks partake in everything from downtown Cooperstown trips, to lake visits, to breakfast beer tasting, to campsite breakfast cookouts. No matter what you choose to do, the retelling of Friday night stories break out quickly and everyone is doubled over in laughter as everyone helps to recount stories that no one person can completely recollect on their own. Before you know it, Saturday morning was gone and people embark on either napping, prepping for the tasting portion of the festival, or taking brewery tours and buying take home goodies from the brewery. With the tasting session beginning an hour later than in the past, it meant there was one more hour to shake any lingering cobwebs loose from the prior night before going at it all over again. The Tasting Session From my rough count and far from official, the total number of participating breweries and importers was down 5, or roughly 12%, from last year. While I find this curious--but didn't really plug around for any answers--it really didn't matter. With the conspicuous exception of a few non-Belgian-inspired interloping brews, there's really no shortage of great Belgian and Belgian-inspired brews from around the world to keep every beer palate happy. Even with my checklist of roughly 20 or so beers that I was hoping to sample, I only knocked off a little more than half of them. There's that much goodness floating around this festival. So, what were they you ask? Winners, Losers? Winners are the easy ones. Here they are, in my book, with a few notes for reference. (in no particular order) ~~Hof Ten Dormaal Blond, Stillwater's Statewide Saison and Cellar Door, and Emelisse Imperial Russian Stout- Brian Ewing and his 12% Imports continues to impress with high-quality hard-to-find Belgian ales. Andy Dickerson of Teresa's Next Door says that he carries this in bottles. ~~A Little Sumpin' Wild- The "big brother" of A Little Sumpin' Sumpin' from Lagunitas; this apparently is due to be released in bottles this Fall. I recommend seeking out this very well-balanced "sour". ~~White Birch Brewing brought a lot of interesting looking beers with ingredients/descriptions like pears, toffee, caramel, noble hops, rye chocolate, coffee, grape skins, vanilla, chardonnay, and on and on. I only tried the Tripel (10.4% ABV, wow!) and Wrigian (10% ABV rye, ditto the wow!) and wished I would have come back for more. Plenty of others also seemed intrigued by these beers. ~~Allagash. Period. One of our country's leading breweries, particularly in the realm of barrels, Belgians, and bigness. This time, the Larry (sour) and dry-hopped Confluence gravity-poured stole the show. ~~Can't say whether I've had the Saison from St. Feuillen before or not. I don't see it on their product page, so I'm not so sure it's a regular offering. Too bad for many, it should be. It's a really nice take on my most oft-favorite style. ~~Cuvée des Fleurs from Southampton Publick House in the Hamptons is a perennial favorite of mine and one that is usually not that easy to come by. What a treat to see it at the festival again this year. ~~Never heard of Bobcat Cafe Brewery before. After tasting their funky Saison de Cassis, I'll be on the lookout for them next time traveling around Vermont (Bristol, to be exact). ~~At the risk of sounding like I'm kissing up to the host, the new Zuur from Ommegang really does deserve plaudits. Brewed in collaboration with Liefman's over in Belgium, it's got that going for it right of the bat. Then to be a drinkable kriek that is mildly tart is an even better thing. This was our VIP gift bottle giveaway this year from the brewery and we've already made quick work on one of the bottles. ~~Sixpoint Brewing from Brooklyn across board was as solid as ever. They put up two beers, beer lovers knocked 'em down. They put up two more, ditto. The first two that I had, Ghost Face ("spiced saison with coriander and sea salt") and Loaded ("Belgian IPA with New Zealand hops and Saison yeast), were early festival winners for me. Only to come back later near the end of the four hour session and be surprised by their Ollie Disaster ("Flemish Red-inspired") and Lux Biere ("a table saison"). Though, most anything coming out of Sixpoint is usually pretty good and that should not be a surprise. At 3.4% ABV, the Ghost Face was one of my top 3 favorites of the day. ~~What was everyone else looking for? Taking an informal poll of everyone I ran in to, the most common themes were The Bruery, Captain Lawrence, and Ithaca. In addition, many agreed with my picks of Hof Ten Blonde, Lagunitas Sumpin' Wild, and Allagash Larry and Confluence as some of the festival's best. ~~The only uniformly "what were they thinking award" that I heard from across the crowd went to Butternuts. You may know them of Porkslap, Heinnieweisse, and Snapperhead fame. Now they've gone and tried to make themselves a 'Trappist Ale'. The description alone was bait for the curiosity-seekers: "Brewed with 75% maple sap. Sap is soured, lending blue cheese mold aroma. Trappist yeast is used to ferment giving a clean finish. 8% ABV. Certainly don't know about the alcohol, because not only did the aroma obscure anything else going on in this beer, so did the flavor. "Love my blue cheese with my beer, not in it" was a sentence often repeated as I stood by the table to overhear other opinions. Can't figure what else to say about this beer accept how, um, interesting it was. Darkness Falls This is typically the point in my annual wrap-up of Ommegang's BCTC event where my commentary begins to trail off into.....and so we went back to our campsites.....cooked dinner.....drank more good beer.....embarked on more shenanigans to tell the grandchildren.....saw and heard things never to be repeated again. And that last point has always been an important one for me. When attending (especially) these type of events, I must seek out the fine line in the middle ground in which to walk between beer geek consumer and industry blog writer guy. Even though you'll occasionally find a few pictures of late night debauchery in my wrap-ups of festivals like BCTC, my comfort zone does not include taking things that are said or done and publishing them on The Brew Lounge. There's just not usually much good that can come from such things. Plus, it really could destroy goodwill and future communications. At some point, even though many industry folk are still, I guess, technically on the clock, they do deserve there own down time and should be allowed some privacy to conduct their own fun 'n' games without fear of being blabbed about on the Web. So the camera for the most part went away after dark. Fair enough, don't you think? Casey and Nick in a golf cart...now that's an entirely different story! The (second) Morning After How to end, how to end this? How about with Sunday morning? Another picture perfect day. One where we could break down camp without fear of being downpoured upon as in past years. It'll never cease to amaze me, I tell ya, how for all of the damage that folks inflict upon themselves on Saturday night at this festival, that so many folks bounce right back on Sunday morning--or, at least, give the appearance of bouncing back--to begin breaking camp as early as 7am-8am to get on the road and home. Net result: Ommegang's BCTC is still one of the best weekends each year that you can have in the Craft Beer Industry in the U.S. Still haven't been? Mark the calendar and make next year's your first. p.s. Want a taste of late night fun and games with live music? Check out the fun video below (or just use this link). I haven't officially cleared this posting to YouTube with the Hackensaw Boys band, so I hope they appreciate the publicity....they certainly deserve it. Awesome read. If you're looking for pics of the Hackensaw Boys or of the event from that year I'd be happy to share. Can't wait for this coming Saturday's! I hadn't checked to see if they're on the music guest list again this year?